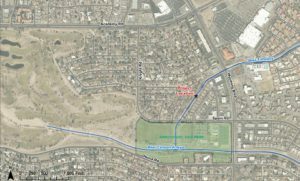 AMAFCA and the City of Albuquerque have begun construction on improvements to the Lower Bear Tributary Arroyo. The arroyo extends from Wyoming Blvd. to Spain Road, just north of Arroyo del Oso Park. 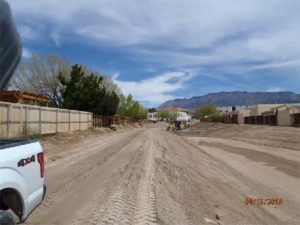 The arroyo improvements include cleaning out the concrete and trash from the arroyo and adding a maintenance road along the northwest side of the arroyo. The project also includes adding improvements to facilitate the removal of trash and debris from stormwater flows to improve surface water quality in our community. The construction is currently scheduled to be complete in early July 2019. Week of April 22-26, 2019 – Construction Update: This week, earthwork will continue in the channel, with continued grading of the new maintenance road along the west bank as well as earthwork at the Wyoming Blvd. culverts in preparation for the concrete placement. The contactor has installed a flow diversion through the project to protect their work from stormwater flows. The contractor will be preparing the channel side slopes for preliminary seeding as soon as is practical. Construction materials will continue to be hauled to and from the project site with large trucks.